The FitDesk Under Desk Elliptical enters a market for under desk ellipticals where many units are positioned as 'jack-of-all-trades' devices, fit for the living room, weight room, or office. But the FitDesk does not make the mistake of spreading itself too thin, becoming a 'master of none'. It's designed for specifically for desk use, and operates well in many workspaces. Low pedal height rotation (but not as the company claims, the lowest). Uses a fluid shuffle motion found in larger elliptical machines. Built-in handle and wheels for easy transport. Includes a wheel lock to keep your caster-base office chair from rolling back as you pedal. Resistance level is changed with a foot lever. Has a built-in foot massage bar. The unit is long; to function properly, it will likely stick out from behind the desk. Despite the built-in handle and wheels, it is bulky and cumbersome. Users report squeakiness during pedaling and sometimes knocking sounds. Manufacturer recommends using Pledge as a lubricant. Boost the price, boost the quality. Durability on this machine is excellent compared to the Stamina products. And it’s designed specifically for use while sitting. It boasts one of the lowest pedal height rotations in the market, so you’re less likely to hit your knees on the bottom of your desk. The downside is the length and weight. Only recommended if your desk space has room for it and you've got the upper body strength to move a 31 pound device under your desk. Most other under desk ellipticals are positioned first as trainers for cycling enthusiasts who want to beef up their quads while watching TV. They can then be adapted to under-desk use while working at a computer, with varying degrees of success. 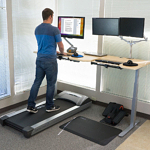 But the FitDesk is a unit engineered specifically for desk use. A low pedal rotation height in the FitDesk Under Desk Elliptical boosts chances your knees fit under the desk. 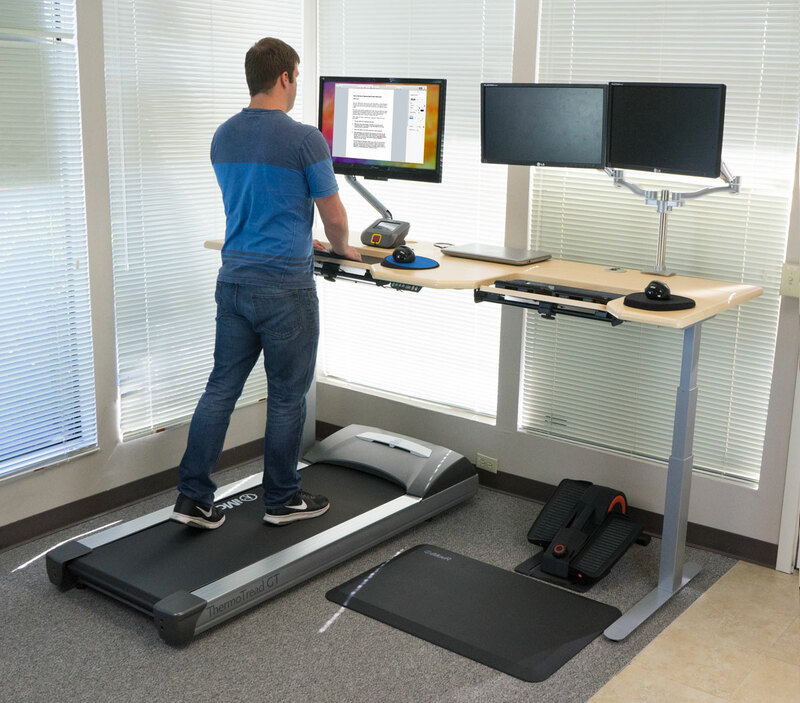 Thoughtful design and quality engineering went into making the FitDesk Under Desk Elliptical. It claims to have the shortest pedal rotation height on the market, (though we measured in the lab and it's exactly as high as the newer Cubii's pedals). This height benefit over other units definitely comes in handy when you’re trying to fit your unit underneath your desk. As you may have already surmised, hitting your knees on the underside of your desk is actually one of the biggest complaints from desk pedalers who haven't yet gotten the memo on switching to a height-adjustable desk (and preferably one with a keyboard tray for proper ergonomics). Before you buy an under desk elliptical, you'll definitely want to check out our primer on How to Set Up an Ergonomically Proper Desk Cycle. The above-average length of the FitDesk Under Desk Elliptical requires a long, backless, and adjustable height desk. The biggest issue we see with the FitDesk Under Desk Elliptical has to do with its ability to fit into your workstation. At 29 inches in length, the FitDesk is the longest desk cycle among the dozen competing units our review team has looked at. In fact, many users complain the unit sticks too far out from under their desks for them to sit comfortably and type; it pushes their chair placement back, requiring a lunge forward to reach the keyboard. Put the FitDesk towards the back of the desk and it might protrude out the other end. When there’s space for this, it works like a charm, but the problem is that many desks are against walls or have their own backs, and there is no space for the unit to stick out. The other thing we must point out is that the FitDesk elliptical weighs more than most; at 31 pounds, it's that much more cumbersome to move out of the way when you're done pedaling. So, we have to qualify any recommendation for the FitDesk by saying that it is vitally important you do the measurements to make sure your unit will fit into your workstation. Once this has been determined, the FitDesk is an excellent option for the aspiring desk cyclist. One of the distinguishing characteristics of the FitDesk Under Desk Elliptical is that it actually uses the fluid shuffle motion found in larger elliptical machines you’ll encounter at the gym. Other products on the market offer abbreviated elliptical motions; they are shorter, and especially in the cheaper models, jerky and less fluid. The FitDesk boasts a fluid shuffle motion, an electronic exercise monitor, and a convenient foot lever for adjusting tension. The FitDesk also packs a few more benefits. It has the ability to adjust tension by using a foot lever instead of reaching under your desk and using your hands. It also has a foot massage bar in case your feet get tired during the day and you want to rest for a moment and stretch them out. This seems like a good time to mention we don’t actually recommend pedaling all day. In fact, many users find pedaling and typing difficult, and especially task switching. Studies at Indiana University-Purdue University Indianapolis (IUPUI) support the conclusion that pedaling is better done for short increments during the day while consuming content rather than producing it. 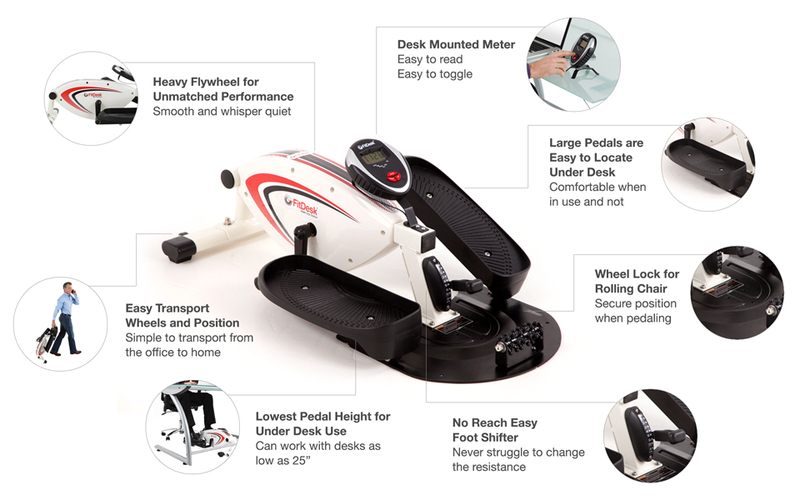 The designers of the FitDesk Under Desk Elliptical created a solid machine that does its job well. In case of squeakiness, the manufacturer claims you can use Pledge as a lubricant, but we'd strongly recommend against that and suggest a 100% silicon oil lubricant like we use on our treadmill desks. FitDesk even throws in a wheel lock to keep your rolling chair in place, and the unit comes with a handle and wheels for easier transport. Given the right space parameters at your desk, it will "fit" in just fine. See our comprehensive Comparison Review of Desk Cycles and Bike Desks. Squeaks all the time, I tried lubricant, liquid silicone, and tried taking the pin out and lubricating. Still squeaks all the time. The company will not help. Anybody find a solution? It is garbage if it can’t stop squeaking!!! We really enjoy our fit desk under desk elliptical. We have the dreaded squeak so will hunt down some silicone lubricant today. We also have problem with the unit throwing grindings from the pedals attach points. This has happened from day one and we expected that this would stop after a few days of use, but it continues now into our third week. The manufacturer’s instructions indicate that the unit should be placed on a protective surface but they should point out that a light coloured carpet is not what they meant. The display resets itself with continually so will replace the battery to see if that helps. Overall it is quite enjoyable. That wheel lock for your office chair is a positively brilliant feature. I can’t really do anything about the height of my cubicle at the office. But I do have an adjustable keyboard tray set higher than the desk…so would that prevent me from banging my knees when using this? I currently have a MagneTrainer under my cubicle, but it doesn’t get much use precisely because of the knee-banging issue. Would this be better?